Renamed in 2016, PM Legal includes PM Investigations, inSync Litigation Support, American Clerical Service, Aetna Judicial Service, Federated Process Service, Lex-Serv and Premier Legal Services. PM Legal is the leader in Process Service, Investigations, and Court Services for trial lawyers, paralegals and legal secretaries at law firms, insurance companies, government agencies and financial institutions in the New York City area. To learn how PM makes it easier for its clients to focus on a winning litigation strategy, visit www.pmlegal.com. Founded in 2000, eLaw is the leading provider of online docket-management services in New York and New Jersey. It is the single source of critical knowledge for busy legal professionals. With online access to courts and dockets, more than 100,000 subscribers use eLaw to efficiently manage cases, reduce expenses and improve productivity. Subscribers have access to federal, state and selected local and appellate courts in New York and New Jersey, and they receive automated monitoring of cases of interest and alerts to events on registered cases. eLaw provides automated synchronization of court dates with calendars on the Apple iPad and iPhone, Microsoft Outlook, Android, Google and several major case management systems. eLaw also uniquely offers custom, on-demand reports to improve business intelligence. eLaw electronically monitors appearances and decisions for cases in New York and New Jersey. For more information, visit www.elaw.com. Lawyers Diary and Manual is the publisher of the iconic book of the same name. Also well-known as the “Red Book,” Lawyers Diary and Manual® (LDM) is the leading legal directory and online resource serving the states of New Jersey, New York, Massachusetts, New Hampshire and Florida. LDM includes the statewide attorney directory and legal guide that was first published in 1888. It continues today as the New Jersey Lawyers Diary and Manual and is the Official Bar Directory of the State of New Jersey. In 2011, the online version, LDMonline™, became available and is a comprehensive database of the legal community, including lawyers, firms, courts and legal support services. Tracking over 500,000 attorneys, LDMonline users are able to create and store notes and favorite listings with searchable annotation and bookmarking, and every subscription includes complimentary mobile access via LDMmobile™. For more information, visit www.lawdiary.com. 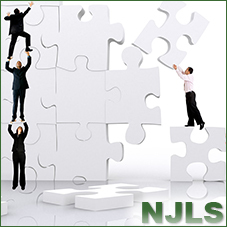 InfoStore Records Management, a member of the 2-20 Family of Companies, has established a formal partnership program with NJLS, blending the best in secure document storage and award-winning courier services for law firms in the tri-state area.